Greenhouse gases (GHG) accumulate in the atmosphere and block the heat of the sun from escaping back into space. In the long run, this will change the climate, requiring major adjustments from all species and natural systems to adapt to the changes. In the short run, it is thought that greenhouse gas emissions are causing increasingly extreme weather patterns, which also have significant effects on human systems and the natural environment. While some greenhouse gases are emitted naturally, the consensus among international scientists is that the burning of fossil fuels is the cause of some recent global climate change, and is likely to cause considerably more in the future. Because of the costs that will be required to adapt to climate change, this is a cause for great concern in most of the world, and efforts to reduce GHG emissions are widespread. As the world’s largest emitter of greenhouse gases, the US contributes about 23% of the world’s emissions while representing only 5% of its population. Figure 38.1 shows New Jersey’s GHG emissions over the past forty years. 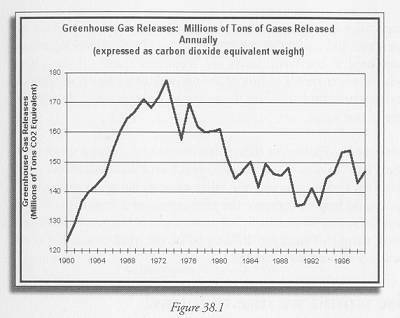 Our emissions dropped steadily through the 1970s and 1980s but began to climb again in the 1990s. The state has established a goal of reducing its emissions by 2005 to 3.5 percent below its 1990 level. (1) Based on trends through the 1990s, we are not on track to meet this target, though more recent data suggest that we have begun to move in the right direction. The state has implemented programs both to reduce consumption by improving energy efficiency and to encourage energy users to switch to non-polluting electricity sources such as solar power. These do appear to have had some effect, and probably will have more. They include voluntary emission reduction programs by industry, financial incentives for energy conservation by both individuals and businesses, and subsidies for investment in non-polluting renewable energy to replace conventional electricity generation. The state itself has also taken the lead by purchasing a significant portion of its electricity from nonpolluting renewable sources. So far these measures have combined to reduce GHG emissions by about 2.2 million tons relative to projected “business-asusual” levels. The new programs that will come into effect in the next year through the Clean Energy Program can be expected to bring about further reductions. (2) The decreases in emissions in the 1970s and 1980s are probably due to a combination of economic restructuring, energy price increases, substitution of nuclear and natural gas for coal-fired power plants, and conservation. In 1999, 88 percent of New Jersey’s GHG emissions resulted from the combustion of fossil fuel. The single largest activity generating GHGs is transportation, which accounts for 35% of our emissions. Electricity generation is second, with about 20%, and industry, commercial activities, and residential use each account for a smaller share. (3) This suggests that no one sector will be able to accomplish all of the reductions needed to achieve our goal. Our dependence on private automobiles is clearly a major cause of the problems, but efforts will be needed in all areas if we are to make a significant dent in our contribution to global warming. Based on estimates provided by Michael Aucott, NJ Department of Environmental Protection. By 2005, reduce GHG emissions to 3.5% below 1990 levels, or to 130 million tons of CO2 equivalent. 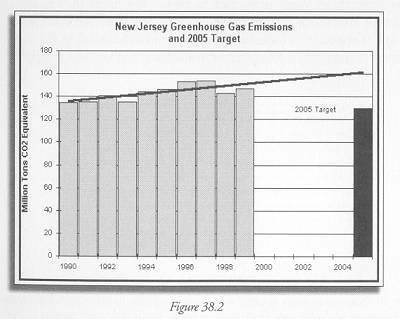 (1) New Jersey Sustainability Greenhouse Gas Action Plan, Published by the New Jersey Department of Environmental Protection, December 1999, http://www.state.nj.us/dep/dsr/gcc/gcc.htm. (3) Estimates of New Jersey GHG emissions provided by Michael Aucott, NJ Department of Environmental Protection.